It’s that time of year again; a time to give thanks; a time for football; a time for parades; a time when families gather round a table to share in a feast usually consisting of one of the most boring foods of all time (turkey) and a bunch of vegetable sides. 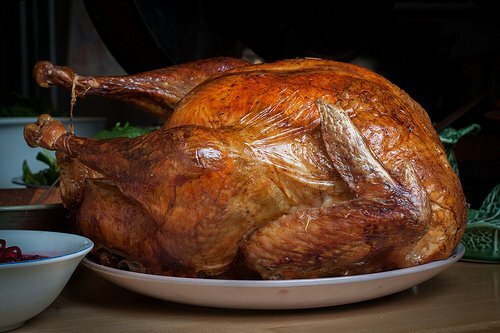 Seriously people, why on earth are we eating turkey on the one holiday that is centered on the meal? Can’t we could do better than turkey? I’ll save that rant for a later date. Here is what you came here for: 10 Interesting Thanksgiving facts and stats. This should give you a few nuggets of turkey day knowledge that you can wow your friends and family with while you are all sitting around the table eating (sigh) turkey. Bonus: Did you know that in 1939, FDR actually changed the official date of Thanksgiving to the second-to-last Thursday in November….the change only lasted 2 years. Disclaimer: This post in no way reflects the quality of my Thanksgiving dinner. My sister makes an excellent Thanksgiving meal, so if I must have turkey and vegetables on Thanksgiving, there is no one I’d rather have cook them. In other words, please don’t disinvite us!